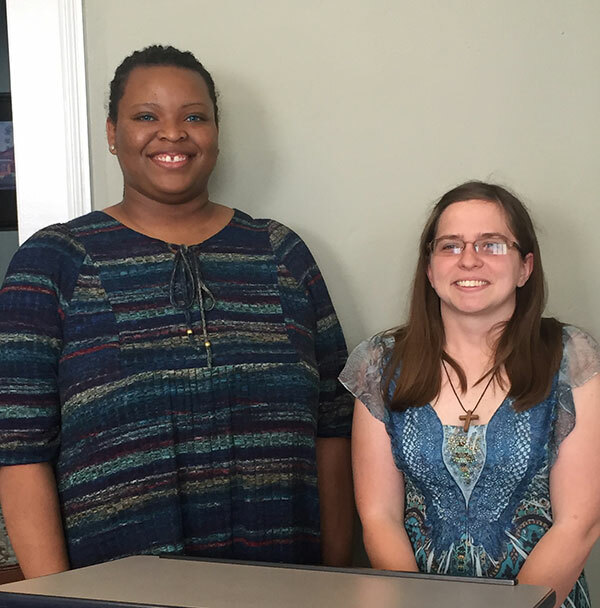 Middle Georgia State students Hope Fuqua and Samantha Morgan made a bit of University history when they became the first students to complete all of the coursework required for the Bachelor of Arts in English on the Cochran Campus. The University began offering upper-division English classes on the Cochran Campus several years ago, but students typically had to commute to the Macon Campus to complete the all-important senior capstone course. Fuqua and Morgan changed that on May 2 when they successfully presented and defended their capstone projects to English faculty on the Cochran Campus. Dr. Chris Cairney, assistant chair of the English department, taught the capstone course on the Cochran Campus. Fuqua's topic was "Faustian and Promethean Allusion in Frankenstein." Morgan's topic was "Architectural Othering in The Hunchback of Notre Dame." The senior capstone course challenges students to demonstrate the depth and range of knowledge and skills acquired in the MGA Bachelor of Arts in English program. Students who succeed in the capstone course produce original and substantial scholarly research papers of 20-25 pages. In the oral presentations, students share essential elements of their seminar papers with the faculty of the English department and other interested members of the University community. Dr. Amy Berke, English department chair, said she is optimistic MGA can continue to expand the degree on the Cochran Campus. Photo: L-R, Hope Fuqua and Samantha Morgan.